I've just learned that Barry Craig, known to ambient music listeners as A Produce, passed away yesterday. Few details are known as yet, but we believe the cause of death to be illness, possibly pancreatitis, and that Barry was 59. 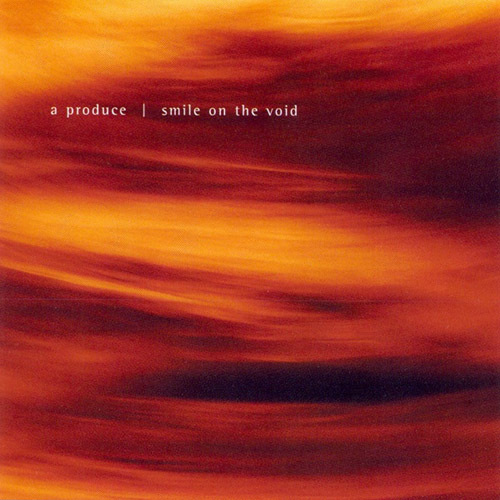 The work of A Produce stands among the best work in the ambient and trance music field. 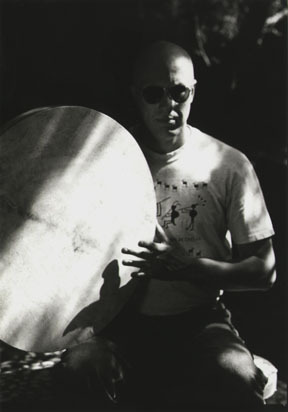 Much of his work was released on his own Trance Port label dating back to the early 90s, often in beautiful letterpress folder editions for such releases as Reflect Like a Mirror, Respond Like an Echo, Land of 1000 Trances, White Sands, and Inscape and Landscape. More recently Trance Port Special Editions had released CDR versions of new albums as well as reissues of out of print items. 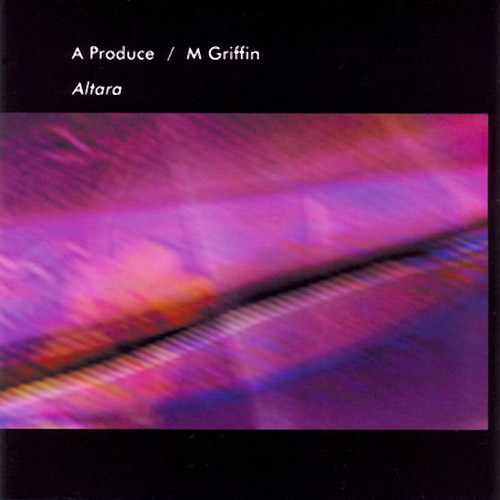 A Produce also released Altara, a collaboration with me (Hypnos founder M. Griffin) on Hypnos in 1999, and the solo album Smile on the Void on Hypnos in 2001. Most recently his collaboration Intangible with Loren Nerell came out on Hypnos this year. We're very sorry to say goodbye to a talented recording artist at a time when he had recently been creating some of his best work. We will add more information when we have it. I'll try to gather some A Produce pictures, but many of them seem to be at least 15 years old. This is the first A Produce picture I remember seeing -- possibly in Wind and Wire magazine in the mid 90s? Very sad to hear this. I've purchased most of Barry's A Produce albums and enjoyed his work very much. My condolences to his family. We'll miss his artistry, but at least his music will live on. If you haven't heard A Produce, check out the sound samples here on Hypnos. 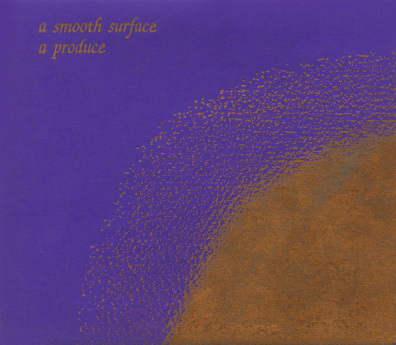 My first A Produce CD (as a listener, I mean -- this pre-dated Hypnos by a few years), the letterpress folder EP version of A Smooth Surface from 1994. To this day, that extended track remains one of my favorite A Produce pieces. 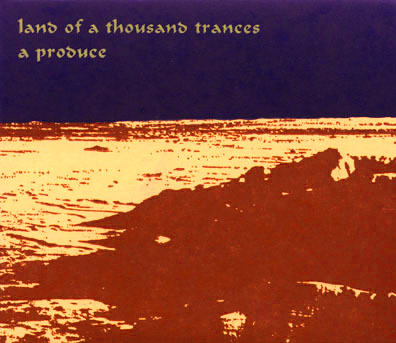 Original letterpress version of Land of a Thousand Trances, which Barry always code-named 1000T (even before the T-1000 in Terminator 2). 1994. This album was later reissued on CDR. 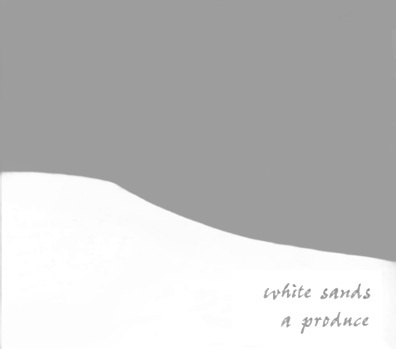 White Sands was kind of an oddball among Barry's albums, including both a selection of previously-released tracks from other albums, and a number of new tracks. This 1995 album was another of Trance Port's letterpress folder editions. 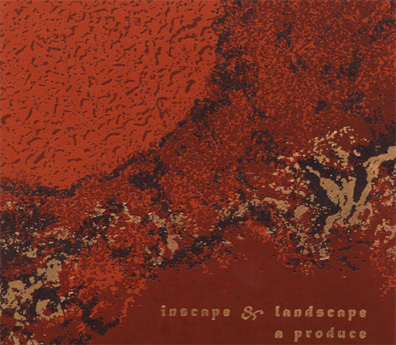 Inscape and Landscape was the last of the letterpress folder editions, and the most handsome of all, with multiple ink colors including metallic gold. While it made for a beautiful package, and the album sold quite well (back in 1996 when lots of people still eagerly purchased CDs), Barry said the expense of getting these folders printed meant even if he sold all the copies he made, he still wouldn't break even. For this reason, after this release he moved on to a jewel case release for his next album. 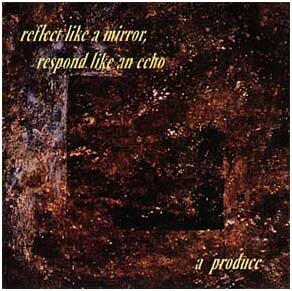 Reflect Like a Mirror, Respond Like an Echo came out in 1997, Barry's first jewel case CD edition. This album, actually a "deluxe" reissue of one of his earliest recordings, came out around the same time I started Hypnos. I wrote to him after reading one of his magazine interviews, and he sent me a copy. 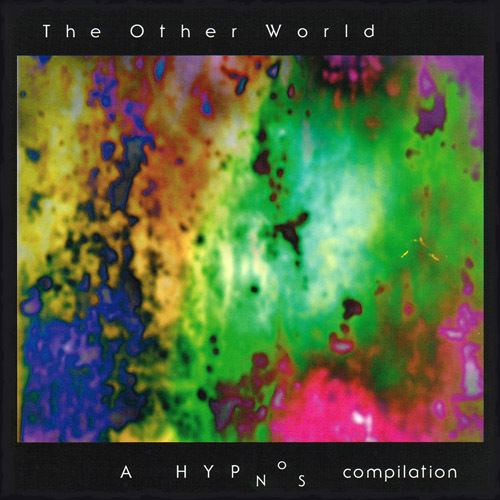 This led to a new, exclusive A Produce track being included on the Hypnos compilation The Other World in early 1998, as well as laying the groundwork for my own collaboration with A Produce, Altara, which came out at the end of 1999. As I got to know Barry a little better, and we commenced work on Altara (which would be an 18 month marathon collaboration-by-mail), he began suggesting friends of his for consideration as possible Hypnos artists, or at least to contribute to one of our various artists compilations. These compilations were assembled with a "no repeat" policy, so once a track by A Produce appeared on The Other World, we couldn't use a track by him again in the future... so Barry sent a number of other artists my way. 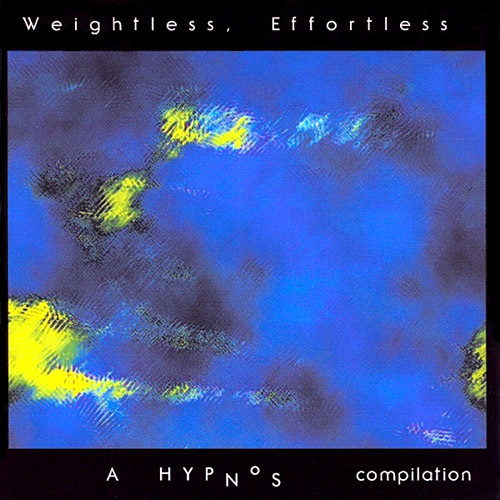 Weightless, Effortless, our 1999 compilation release, included tracks by Dean DeBenedictis (aka Surface 10), Loren Nerell and Scott Fraser, all of whom were referred to me by Barry. choefler and antdude, sorry for stampeding your comments with my flood of historical reminiscences! I appreciate both of you stopping by to comment. I know a lot of people appreciated Barry's work and will miss him. I am so shocked and saddened to hear this terrible news. It was only a few days ago Mike that you, Barry and I were cracking jokes on FB. 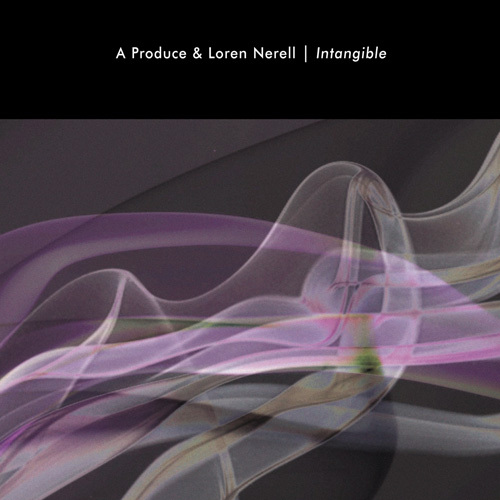 And the new Intangible album with Loren Nerell is fantastic. What a terrible loss. My condolences to his family. Barry was so excited by the reaction we were getting from our latest CD, we were already making plans to start work on a follow up. He will be greatly missed. Thanks for the much more recent photo, Loren. Yes Phil, it seemed to come out of nowhere, at least from an outside perspective. I sent little remarks back and forth with Barry here and there on Facebook, but we weren't in frequent conversation lately. Work continued on Altara long-distance over a long period of time. In the nineties, before fast, ubiquitous broadband internet, and interoperable multi-track recording platforms, most people collaborated long distance by sending tapes in the mail. Barry worked with ADAT multitrack but I didn't have one of those (they were big machines that used S-VHS tapes to record 8 tracks of digital audio). I recorded everything to DAT (tiny 4mm tapes that record stereo digital audio only) and imported those into my PC for editing. Barry had a DAT too, so he'd work out multitrack parts on ADAT, mix them down to stereo DAT, and mail these to me. I'd load these into my computer and layer them with atmospheres and effects of my own, then make a new stereo master of the complex-ified mess and dump that to a DAT, and send that to Barry. We worked on this album almost constantly over a very long period of time. After about six months I thought it was done, and felt very happy with it, but Barry thought it was too much drone, not enough rhythm -- or in other words, too much M. Griffin, not enough A Produce. Incidentally, I've found this is usually the way musical collaborations go, not only the ones I'm personally involved with. It's a back and forth tug-of-war in which each participant yanks things so far in their own direction that the other party must take back as much territory as possible. The sound goes from being too much of one person to being too much of the other person, and sometimes feelings are hurt or frustrations are given voice, before a sort of equilibrium is reached, or one or the other becomes exhausted and gives up. Neither Barry nor I gave up. We kept volleying tapes back and forth, and my recollection is that at the six month mark and again at the twelve month mark, I thought we had a finished album. At one point it was to be called "Seek Nothing," a title which arose out of my own pursuit of Buddhist meditation during those years, until Barry decided he couldn't stand that. He told me he'd let me pick the album title with no further objection from himself, as long as it wasn't "Seek Nothing," and he'd even allow that title to be used for a single track. That weekend I re-watched Forbidden Planet on DVD. It's one of my favorite classic science fiction films, and somehow Altair (the planet) and Altaira (the girl, also known as Alta) stuck in my head. Additionally, Altara had what I perceived to be a Zen or Tibetan Buddhist quality. So the album became Altara. As I mentioned, we "finished" the album twice before it was really done, and released to the world. At the time I was pretty frustrated and impatient, but in the years since then I've learned to admit that the final product was better for having been held up in the seemingly endless repetitive cycle of Barry's "not good enough, let's keep at it," rejections. It's a lesson I've tried to hold onto, whether in collaboration with others or in my own creative endeavors. Sometimes you want to be done with something, to call it finished and let it out in to the world, and sometimes you want this so strongly you convince yourself it isn't possible to make it any better and that to try to do so would be foolish. All it takes is a single instance of pushing through this convictions and actually finding that the work can be improved to recognize the game you were playing with yourself. I thank Barry for helping me recognize this, though it frustrated me mightily at the time. There's nothing like an extended and at times contentious collaboration to change a friendship. I respected Barry's work more than ever, but at the time I told him bluntly that I wasn't sure I had the patience to work together again. We remained in touch, though, and as he began completing tracks toward what would eventually become Smile on the Void, my enthusiasm for the beauty and sensitivity of his musical output overcame my reservations about the difficulty we'd experienced working together. I don't think I contributed musically to SOTV (though I sent Barry a few drones and textures he said he considered using, I don't believe any of them made it into the finished product) but we discussed releasing it on Hypnos. At that time, the work and expense involved in running a proper label, with CD manufacturing and packaging and artwork, had begun to Barry to seem not worth it any more. Those of you who have followed Hypnos for any length of time will certainly have noticed that our releases stick to a sort of visual template. This is intentional, an effort to create a visual identity for the label, something to bind all the releases together. Barry had a number of requests as to layout, type, artwork, packaging and so on, and I had to insist over and over that we couldn't diverge from the Hypnos template to the degree he was requesting. Once I make an exception like that for one artist, then the next guy wants a 16 page booklet, and the guy after that wants a white border instead of black, and a different font and eventually your label's visual identity is gone. We briefly discussed letting Barry just release this himself, and I'd try to help him with distribution and other support, but eventually we agreed to a co-release between Trance Port and Hypnos. This allowed a different approach with regard to various elements in variance from the usual Hypnos template. That's not to say everything everything went smoothly. The average Hypnos CD package design might go through 4 or 6 or 8 revisions before we get the artwork and the text all worked-out, proofed and dialed-in to everyone's satisfaction. The design process for SOTV took several months, perhaps 30-40 revisions. But when it was done, Smile on the Void was a beautiful package and a wonderful recording. The title is taken from an obscure science fiction paperback novel by Stuart Gordon, who went on to direct such cult horror films as Reanimator and From Beyond. Several times I asked Barry about the significance of this title, and I never received much of an answer. He sent me a copy of the book, and though I love science fiction and weird metaphysical literature, I still didn't quite get it. In the end I decided Barry took the title at face value, and that it might simply be about maintaining a positive attitude in the face of an indifferent or hostile universe. what sad news. Barry was a friend from way back- I remember a lot of our phone conversations about music and life. He had an effortless way of entering that "creative space"- and when he went there, he brought some fantastic music back with him. Jeff, you and Barry were two of my first friends in this realm of music. It's hard not to rush backward through all those mid-90s memories at this news. This is absolutely terrible and unexpected news, Barry will be deeply missed by his family, friends and our ambient community. We are losing talented and unique artist. I never met Barry personally, but I will always remember our pen-pal friendship and his music will always live in my heart!!! I own A Produce's complete discography, with some of them featuring Barry's personalized signature and all these CDs will be deeply treasured for me. Goodbye, Barry!!! My condolences to his family and friends.